This A1 print of my two lovelies cost me two dollars and five cents at my local Officeworks! It is a 'plan print' mostly for architectural plans. Not my own brilliant idea, I saw it on Pinterest! The paper is thin but sturdy enough to be washi taped to the wall! I did brighten it in Photoshop first as advised and if you look hard enough you can see a line running down the left of Josiah's head and one through his hair but it is no biggie to me. This was just a quick casual photo I took on my bed - I love it! Imagine covering a whole wall in these prints, oh the imagination runs wild. This isn't even the biggest size! So cool! Ed note 12th March: The washi tape isn't strong enough to hold this up - I have added blu-tack under the washi tape for now and see how it goes. It has a few wrinkles now as it came down overnight! 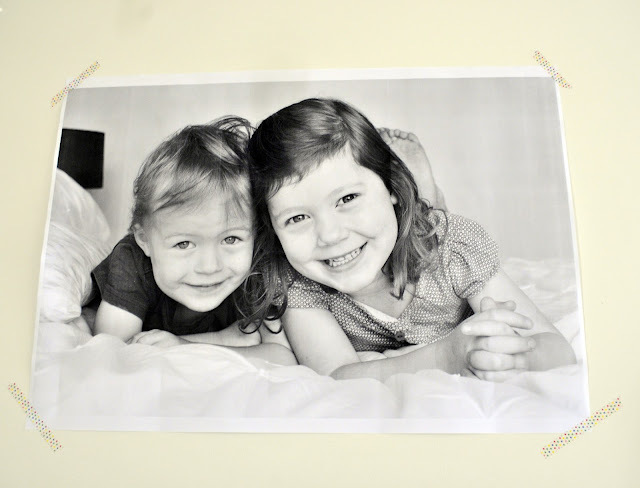 I think this paper would work well mounting it onto foam board with a spray adhesive - get two printed to try it!